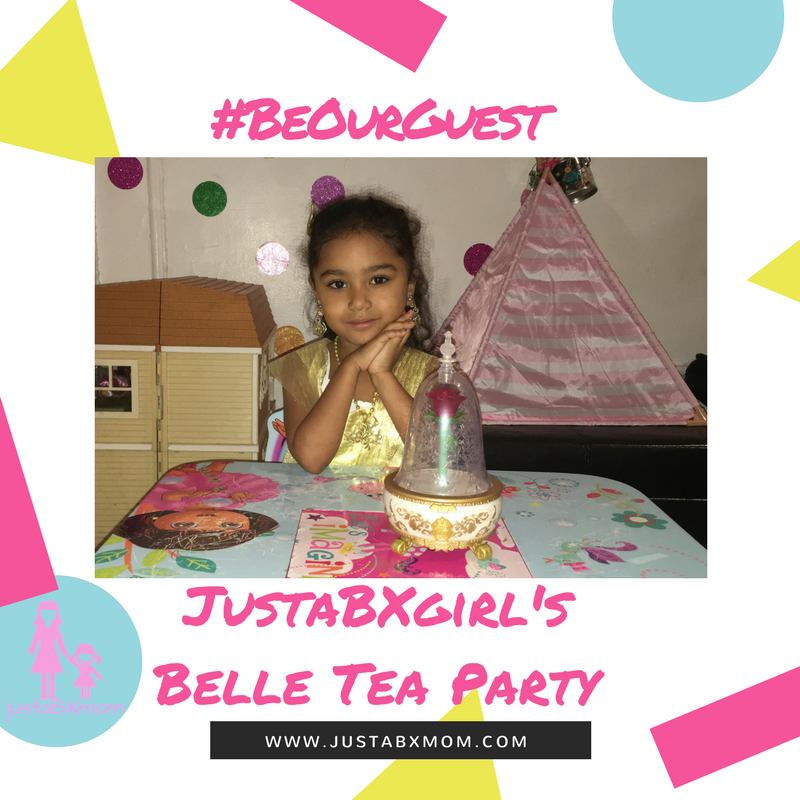 JustaBxgirl has been a fan of tea parties since she was tiny. I’ve been a fan of Beauty And The Beast since I was tiny (or twelve). A Beauty And The Beast tea party? That makes a perfect mommy and me adventure. We received these products for review purposes. As always opinions are honest and are solely mine and JustaBXgirl. Disclaimer: This post contains affiliate links. I get commissions for purchases made through links in this post. Here’s JustaBXgirl and me unboxing the Disney Beauty & The Beast Live Action Enchanted Tea Set and enjoying our first tea party with it. I know, I know we need to work on our video quality. We will get there. Even still, can you see how fabulous this set is? I have definitely lost track of the amount of tea parties we have had since receiving it. It has even made cameos for doll birthday parties and pretend dinner parties. I guess Mrs. Potts is the hostess with the mostest. JustaBXgirl gets a kick out of her eyes closing when you tip Mrs. Potts over. As for Chip’s wobbling JustaBXgirl has decided to take on this tendency as she wobbles all over the house. As you can see JustaBXgirl was transformed into Belle and was very serious about her role. She has requested I purchase a Beast costume so that one of her cousins can play dress up with her. I really love this princess gown. The detail is very well done. Yellow while my cousin’s favorite color isn’t one of mine. This yellow is such a beautiful shade though that you have to adore it. Maybe it’s just because they both have brown hair and love books but without ever having seen the movie JustaBXgirl has really been able to channel her inner Belle. As you saw in the video when she’s in character, she is in character. I guess it helps that we always participate in the story when we visit Disney World. I’m definitely biased but I was taken back by how beautiful my little Belle looked when she put on her gown and accessories. I’ve also learned from my mistakes. I will not be putting this dress in the laundry like I did her Elena one. Oh, and did you see the Enchanted Rose Jewelry Box in the video? How cool is it??? It lights up, blooms, plays Beauty and the Beast and comes with a feather ring!!! I know! Are you thinking what I was thinking? Do we have to share these toys with our littles? Don’t worry, I’m sure your little will let you play too. And play you will want to. And while you’re in the Beauty And The Beast mood enter HomeAway’s Be Our Guest Sweepstakes. If you win please let me and JustaBXgirl be two of your TWENTY guests!!!! So cute! Can’t wait to join in on the tea party fun! Is Your Child Old Enough For Frozen On Broadway?